(MONEY Magazine) -- If you're among the two-thirds of Americans who are overweight or obese, shedding pounds is a nobrainer way to save. For example, "even losing 7% of your weight may lower blood pressure enough to erase the need for medication," says Cheryl Rock, a professor at the medical school at the University of California San Diego. Problem is, losing weight and keeping it off isn't easy. Sure, you can diet on your own for free. But research indicates it's harder for many people to stick with a DIY approach than with a more formal one. And some studies have shown DIYers lose less weight than people on structured plans. The three major commercial programs -- Jenny Craig, Nutrisystem, and Weight Watchers -- "are the only ones with [rigorous] randomized studies that confirm that they actually work," says Adam Tsai, assistant professor of medicine at the University of Colorado. While no study compares the effectiveness of the Big Three head to head, research shows that people lose weight on any of them: one to two pounds a week, the companies say. So which one -- if any -- is right for you? The answer depends mostly on how much you're willing to pay for convenience and handholding. The numbers below assume you plan to lose 25 pounds in six months and choose the most popular program options available. For an apples-to-apples comparison, MONEY's price-per-pound estimates include the cost of everything you'll eat over those six months (assuming you spend $12 a day on food -- as does the average American with family income over $70,000 prorated for the two plans that supply some meals). You get a detailed diet plan that imposes certain limits, but within those you eat what you want. 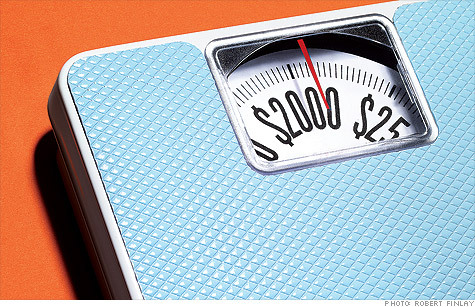 Swap tips at weekly weigh-in meetings with fellow dieters. Weight Watchers gives you lots of practice in creating low-calorie, portion-controlled meals. That's key to weight maintenance, notes Victor Stevens of the Kaiser Permanente Center for Health Research. A study published in the Journal of the American Medical Association showed that after two years, Weight Watchers participants were six pounds lighter than their starting weight; DIYers had regained what they lost. Nutrisystem sends you prepackaged meals that comprise about 60% of what you eat; the rest you buy yourself. Free counselor support is available via phone or online, but there are no scheduled get-togethers. That's a negative: Studies show that regular meetings help people lose. Like Nutrisystem, this program requires you to eat mostly its branded foods, supplemented with the regular stuff. The main difference: Jenny includes weekly one-on-one counseling with an employee who shares things like exercise tips and recipes for when you're weaned off packaged meals. That's helpful, particularly if you crave personal attention. But given the price of a truly personalized plan (see below), Jenny may not be the most cost-effective choice. Louis Aronne, professor of medicine and obesity at Weill Cornell Medical Center, says a registered dietitian who specializes in weight control (find one at eatright.org) "is one of the best ways to spend your money." No matter what, talk to your insurer and employer: "Many cover some of the cost of weight-loss programs or dietitian visits," says LuAnn Heinen of the National Business Group on Health. And if a doctor recommends you lose weight to treat a medical condition, you can pay your share from your flexible spending account.